Bookstores are the easiest place to pick someone up. Think about it: a conversation topic is usually in the hand of the other person, people often browse quietly and alone (no need for shouting over music or wingmen), it's easy to pass yourself off as just being polite if the person seems disinterested in talking with you. A low pressure, casual atmosphere for even the shyest bookworm. 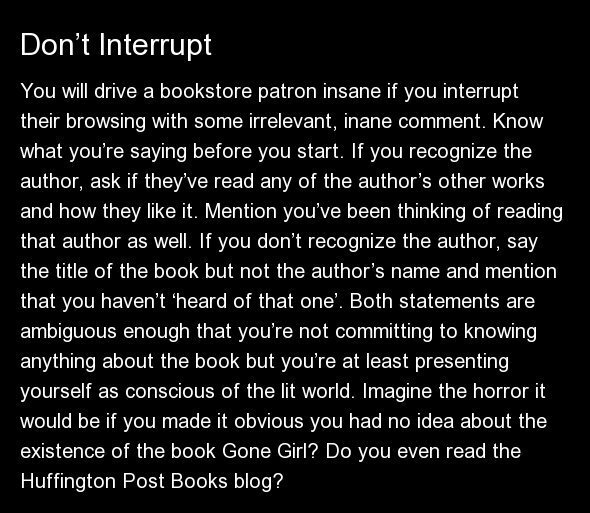 You will drive a bookstore patron insane if you interrupt their browsing with some irrelevant, inane comment. Know what you’re saying before you start. If you recognize the author, ask if they’ve read any of the author’s other works and how they like it. Mention you’ve been thinking of reading that author as well. If you don’t recognize the author, say the title of the book but not the author’s name and mention that you haven’t ‘heard of that one’. Both statements are ambiguous enough that you’re not committing to knowing anything about the book but you’re at least presenting yourself as conscious of the lit world. Imagine the horror it would be if you made it obvious you had no idea about the existence of the book <em>Gone Girl</em>? Do you even read the Huffington Post Books blog?